We were unable to get to this launch, sadly, but I take this opportunity to urge anyone who has not yet seen this wonderful book to mend the situation asap! 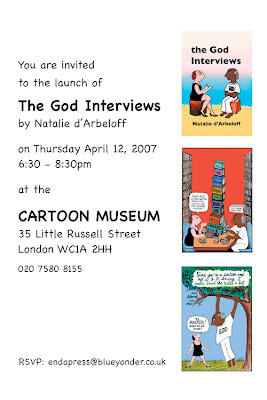 Natalie d’Arbeloff’s enterprise with The Old Stile Press has been mentioned on this Blog, together with images of the amazing one-off artist’s book we had from her some time ago, but all that is just a drop in the ocean! An exploratory trip to her website (see link) will undoubtably lead to regular return visits BUT, for now, I urge you to find out more about the entirely life-enhancing “The God Interviews” by going HERE.